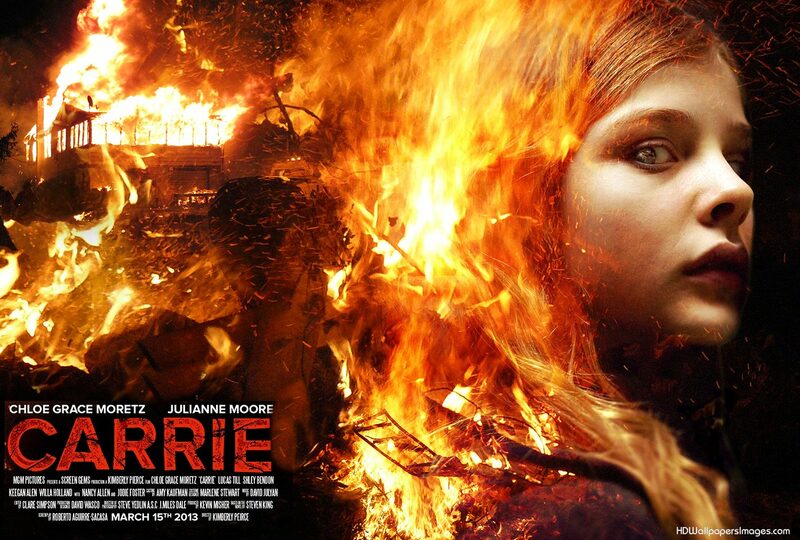 Based on the Stephen King novel, Carrie tells the story about a seventeen year old girl, Carrie White (Chloe Grace Moretz) who lives with her very scary religious fantasist of a mother (played excellently by Julianne Moore). Carrie is removed from society, shunned on the basis of the rules her mother enforces on her. She has no friends, wears clothes that don’t fit into modern society, and has no clue to what it even feels like to be normal. She doesn’t want this, but it is hard to rebel against a mother who locks you in a small closet for hours if you disobey her. Carrie’s miserable life becomes worse when she gets her first period after gym class in the showers. The teenage girls lose their heads and follow the orders of Chris (Portia Doubleday), the school bully, and starts throwing Carrie with tampons. The coach (Judy Greer) shows up and help Carrie recover some dignity and modesty, and no one notices the one light explode in the showers, or no one thinks much of it. Carrie is punished by her mother for having her first period and spends some time in the closet, and when the door gets a crack in Carrie seems to become aware that she has some form of magic ability, and the following day she starts researching what it might be, trying to ignore the ridiculing she is subjected to. Sue Snell (Gabriella Wilde), one of the tampon throwers is feeling horrible about herself. She doesn’t know what came over her, because she really isn’t such a bad girl. Coach punishes the girls by giving them rigorous training as punishment, and everyone but Chris does it, and when she yells at the girls to side with her, not even Sue does it because they know how wrong they were. Chris is expelled from school and banned from Prom, and vows revenge on everyone, including Carrie. Sue is still feeling horrible about what she did and decides that Carrie deserves one normal, happy night, to go to prom with a handsome guy. Sue convinces her boyfriend Tommy (Anse lElgort) to take Carrie, and he is reluctant, but agrees to do so because Sue is beating herself up horribly about it. Tommy asks and Carrie naturally thinks it is a trap, but she is convinced eventually by Tommy that his offer is sincere. Back at home, Carrie’s mom freaks out, sure that Tommy wants to defile her daughter. Carrie’s powers has now progressed immensely, and through her telekinesis she starts controlling her mother, and says that she will go to prom. Prom night arrives, with Chris planning revenge, and Carrie unaware of it. Will Carrie be able to survive yet another embarrassment at school? What will she do to Chris when she is thrown with pig’s blood? Is Carrie, already unstable, capable of controlling her powers under such strain? I watched this movie to see how the adaption went since I read the iconic King novel sometime last year. I thought that it was rather decently done, and although there were some minor details that were changed, it didn’t deduct from the whole story. I really pitied Carrie. This girl had so much against her, and that particular horror in the shower would have cracked any girl. She had no support at home and her mother was a lunatic, and she had no friends to even help her. Her eventual revenge on the school felt like justice and especially on Chris – who might just make it into the famed hall of asses of all time. Moretz did well as Carrie and I think it might be the first time where she didn’t irritate me senseless. I didn’t catch anything of her characteristic snottiness in this movie and she seemed genuinely unstable as Carrie is supposed to be. I do think that Chris could have been better developed. The movie didn’t really show how awful, cruel and spoiled she is. Also, I thought the movie Sue Snell was better than the book version – she is somewhat condescendingly written I’ve perceived. Ansel Elgort is really a very cute guy deservedly on the rise. He was perfect as Tommy – capturing the high school popular jock who isn’t a bad kid (a bit of a moron, but not bad) and on the way to becoming a good man. Recommendation: not too much guts and gore to put you off bacon for weeks, so you can watch it for some horror street cred.